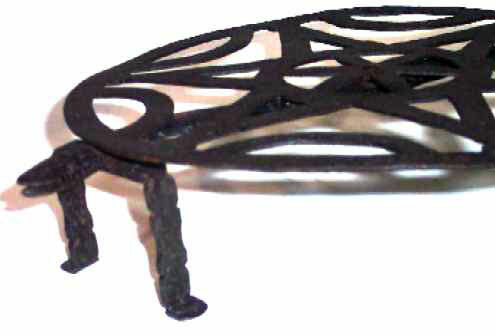 Presented here, a Rotary Gridiron or Broiler most rare. 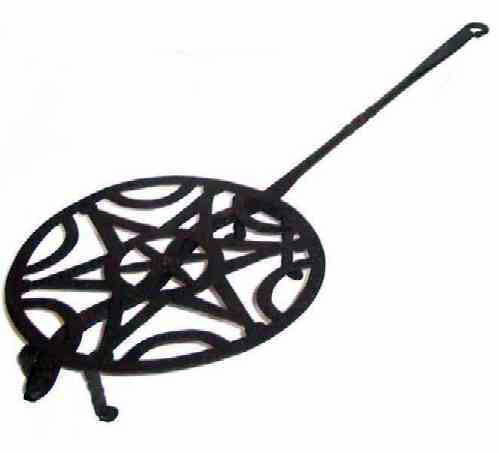 It is an exceptional example of the art of the Blacksmith. These rotary types mounted a round rotating grill on a center rivet that extended to form the handle. There the similarity stops because in this case the handle is the body of a snake! The end of the handle terminates in a little arrow shaped knop and halfway down the handle one sees some intricate turning as a decorative element. The handle proceeds to snake under the broiling surface and terminate in the head of a reptile, complete with a partially open mouth showing some notches for teeth and if one looks closely into the mouth one can see the tongue. Amazing also is the attention to detail which also is evident in the decoration on the four legs on which the broiler stands. 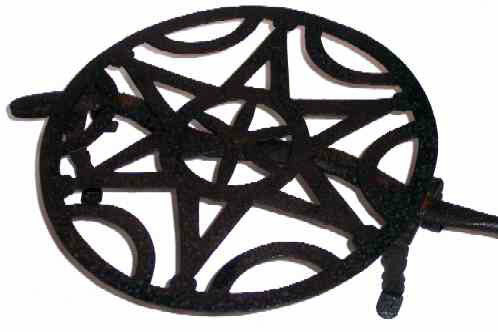 The broiling surface is no less intricately worked with a large 6-pointed star that surrounds a six petaled flower. You have to see this to believe it! Most probably one of a kind. Certainly not a production item as it would have been very labor intensive to make. It probably was made by the smith as a gift for a loved one or perhaps it was a special order piece. In any event, I rather doubt you will see another. It's a utilitarian item that has been raised to folk art of the highest degree through the imagination and skill of the blacksmith. Dating 1750 - 1800, it is truly a work of art.